You guys! I can't believe it is November! I feel like somehow we skipped a few months and suddenly landed here. It feels so surreal. And while I'm still wondering how 2017 has moved so quickly, I'm also extremely excited for the holidays. Christmas is my absolute favorite. Everything about it is cozy and lovely. I love Thanksgiving week too. The food prep, making the menu, gathering your loved ones together, the feast, the Macy's Thanksgiving Day Parade. What's not to love? I've seen so many people debating when to decorate for Christmas. I'm a little shocked because we're only two days into November, but I do get the excitement for the twinkle lights and greenery. I won't be jumping on the decorate-for-Christmas-now wagon, but I am gladly and excitedly jumping all over the Christmas Starbucks drinks asap! My favorite is the Caramel Brûlée Latte, and I can't wait for my first sip. Now back to the decorating dilemma...I'm all for winterizing my fall décor instead of going all-out Christmas right now. How do I do that? After packing up my Halloween decorations last night, I swapped out all of the orange pumpkin vase fillers for white-tipped pinecones; traded out the fall-colored pillows for winter neutral pillows; and mostly kept it simple. Now my house is feeling cozy, like Christmas is coming, but still with an ode to fall and Thanksgiving ahead. Then the day after Thanksgiving, all of my Christmas décor is making its grand appearance!! Back to Halloween for a quick second. 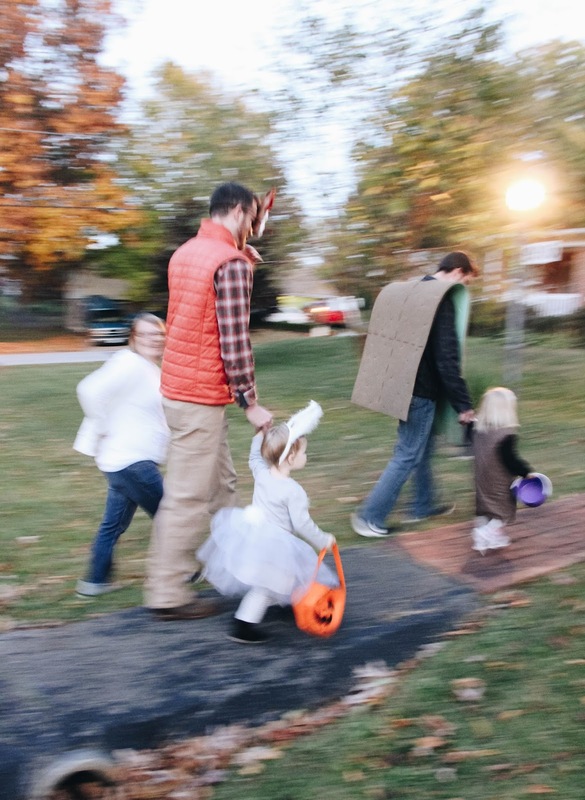 This year we opted to be woodland creatures for trick-or-treating. 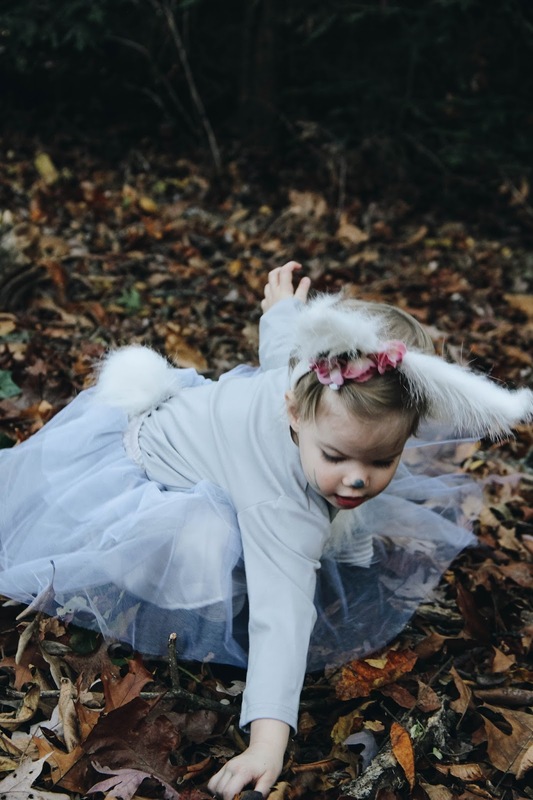 Greer loved being a bunny, and hopped herself all over. I had big plans of DIY-ing her outfit, but caved and bought a pre-made one. I'm so thankful I did. 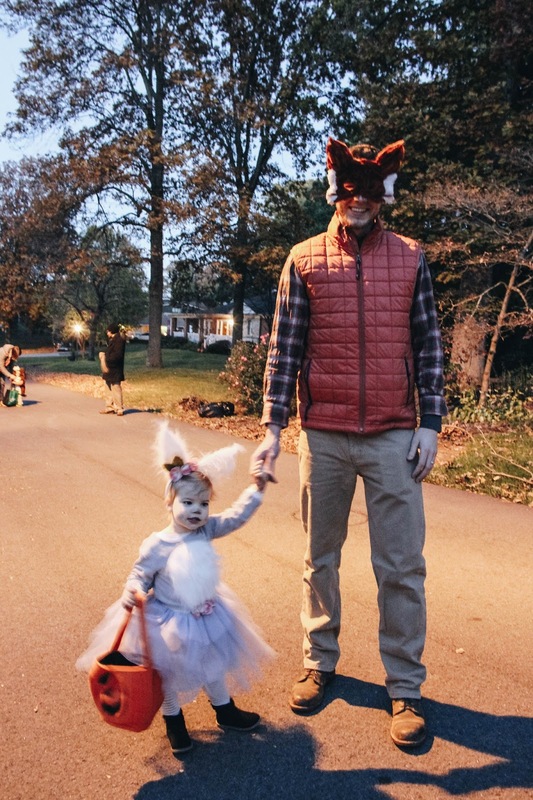 But, I did DIY my headpiece and husband's mask. It's all about a little compromise, and I think it all turned out pretty wonderfully. 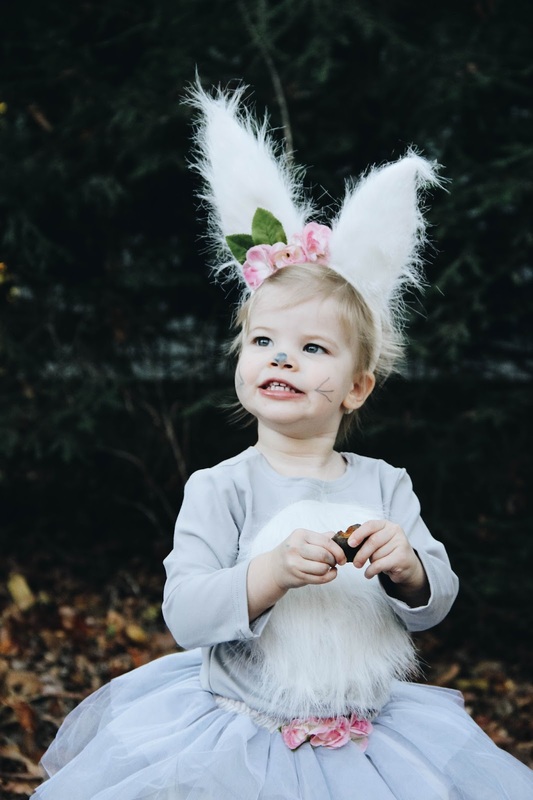 This sweet bunny had the BEST time. And while I had hoped she would love it, I didn't expect her to be so into it at 22 months. 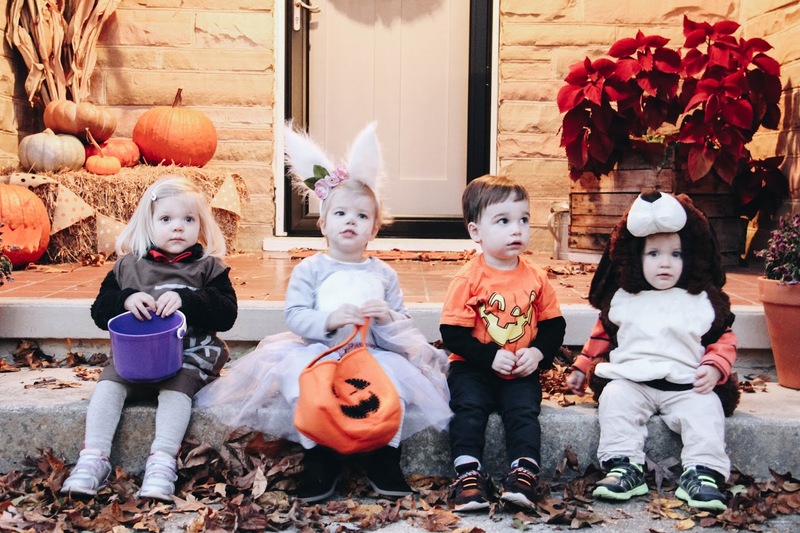 We had some friends over for a simple dinner and then trick-or-treating. 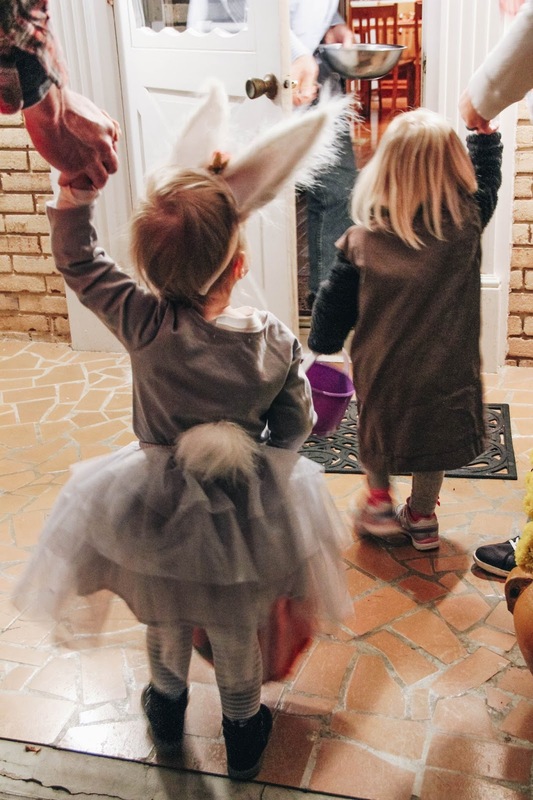 The littles were adorable, and there was so much joy watching them walk around together and gather candy in their baskets. Our girl insisted on carrying her pumpkin basket all by herself, even when it got heavy and full. 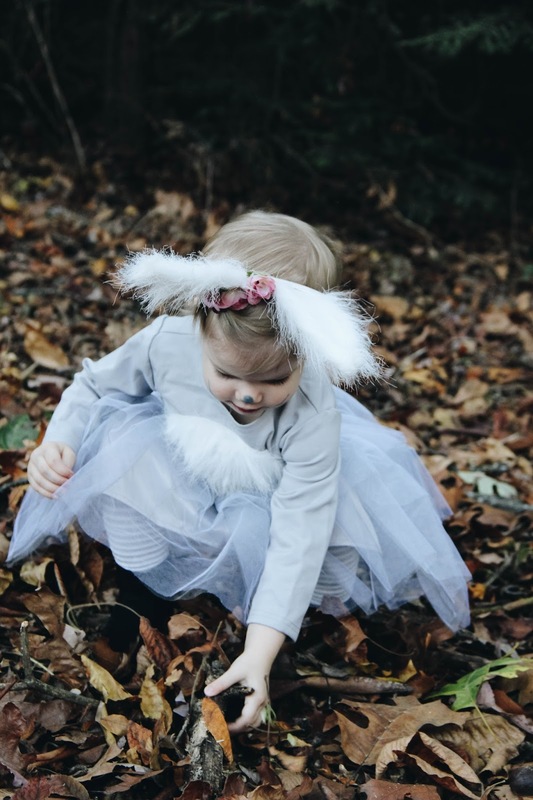 She hasn't stopped talking about trick-or-treating since, and I'm thrilled that it made such a lasting impression on her. The holidays are just going to keep getting better! 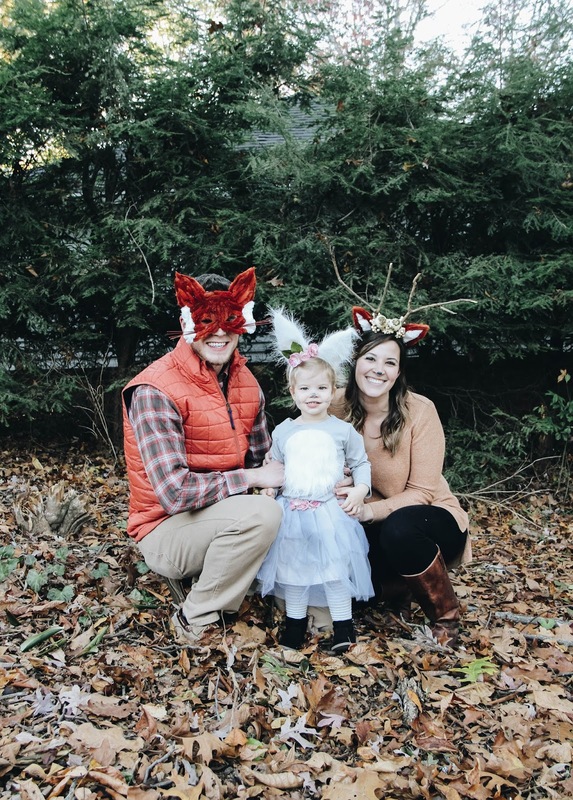 I hope your Halloween was festive and fun! And I hope your first week of November is cozy and lovely!